Most bloggers would likely agree that using Google AdSense is the easiest way to monetize a blog. You sign-up for the program, copy and paste the code for 1-3 ads onto your site and watch the money start rolling in, fractions of a penny at a time. As your readership grows, your earnings increase. It sounds like a great way to make a few extra bucks for doing what you love. Why then, have I removed all Google AdSense ads from my blog? Google AdSense is very unclear about how much you earn by placing ads on your site. Honestly, when I started blogging and using AdSense I knew very little about ad networks and how they calculate what the ad space on your blog is worth. Some networks pay publishers a specific amount when someone clicks on an ad. Some pay a specific amount based on the number of views the ad receives. Others pay a commission when someone clicks and purchases a product that was advertised. There are advantages and disadvantages to each of these types of networks. Umm... I am providing some valuable property on my blog and Google gets to determine how much they are going to pay me but they don't have to tell me how much they're going to pay me. No thanks. AdSense penalizes publishers for invalid clicks and impressions. Google is very clear about their AdSense Program Policies. In theory, I agree with the policy regarding invalid clicks and impressions 100%. It's not fair for people to click on the ads placed on their own site just to make a few extra bucks. It's also not fair for people to try to inflate the number of page views they receive. However, even though I have NEVER clicked on an AdSense ad from my own blog and I do not view my blog a million times a day to inflate my page views, I have had money deducted from my AdSense earnings because of invalid clicks and impressions. What's worse is that there was no explanation of why the money was deducted other than a statement that invalid clicks and impressions occurred. AdSense has a high payment threshold. In the US, you don't see a penny of your earnings until they reach $100 and then, you have to wait up to a month for funds to be deposited into your account. Unless your blog is getting well over 100,000 page views a month you can expect it to take months to reach the payment threshold. 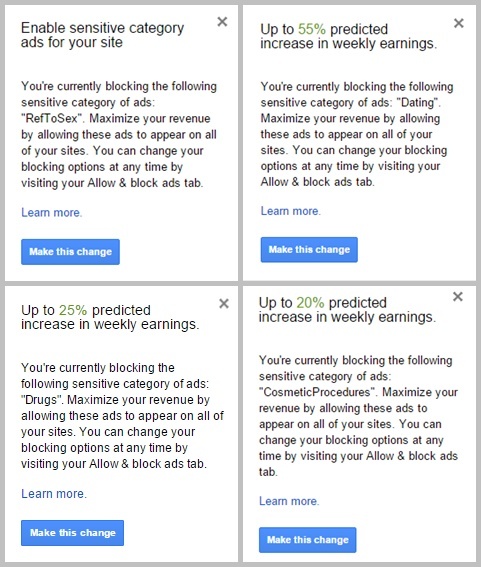 In AdSense's defense, many other ad networks have similar thresholds, but it just doesn't work for me. My blog was filled with ads irrelevant to my readers. I'm sure there's some magical algorithm used to determine which ads get shown on each site. Unfortunately I began to witness and receive complaints about ads that had nothing to do with my blog content (i.e. crafting, hobbies, tutorials), and more worrisome, ads that were simply not family friendly (think sleezy dating services or worse). If I may or may not be earning ad revenue based on people clicking the ads on my blog, I don't want the space filled with junk. More importantly, I value my readers and do not want to offend them with ads that are blatantly inappropriate. It's deceptively difficult to restrict the ad content that is displayed. To protect publishers like me, there are AdWords Policies stating what types of ads advertisers are allowed to share. There are even some topics that are classified as sensitive because not all publishers want to promote products or services that are not family friendly. I greatly appreciate that publishers are allowed to block the sensitive ad categories shown below. 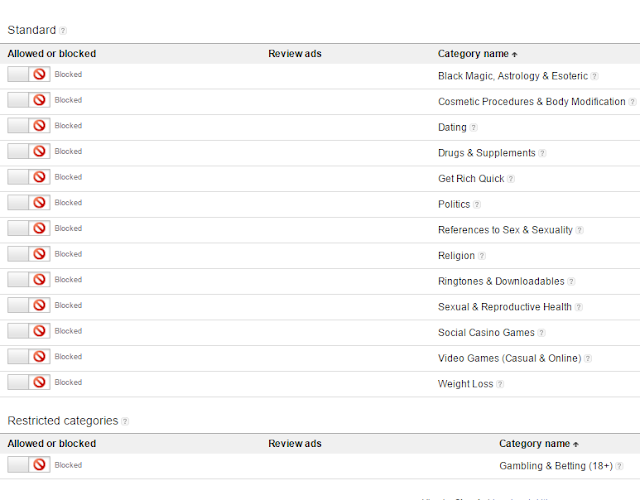 There are also currently 262 other general categories for ads ranging from Arts & Entertainment to Occult & Paranormal and publishers are allowed to block up to 30 of these categories. As a publisher, you can even block ads for specific ad networks or even specific URLs. Unfortunately, even when I blocked categories or URLs, the ads continued to appear on my blog. My only guess as to why blocked categories and ads continued to be shown was either because it takes an extended period of time for the blocks to take effect or advertisers (intentionally or unintentionally) categorize their ads incorrectly so they can reach a larger audience. Either way, no matter how many times I see these notices on my AdSense dashboard, I am not going to approve this type of content. Farewell, Google AdSense. My readers are much more valuable than the meager earnings you sent my way. The Chilly Dog: Google AdSense, You're Fired! 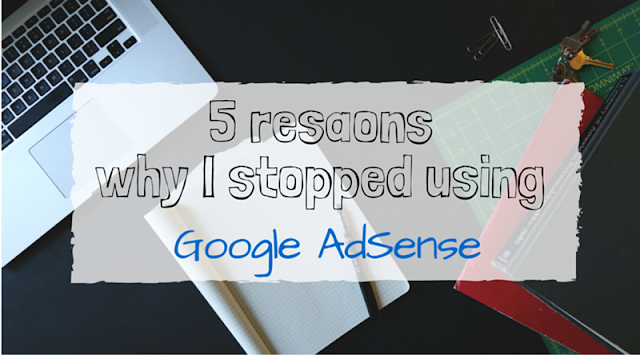 5 reasons why I stopped using Google AdSense to monetize my craft blog.